The view from the summit was stunning. Far in the east the vast plain morphed into the darkening sky while tower-high dust devils whirled up funnels of red sand. We watched them form and disappear and rise again in slow erratic succession. Soon the sun disappeared behind the western horizon and it became cold on the summit. On our descent we spotted our third vehicle closing in from the east. When Marc and Sergey arrived it was already dark and they were glad that they just had to follow our tracks for the passage uphill to the camp. The wind increased and brought a bitter cold. Dinner was a rather unpleasant affair as the wind repeatedly swept the dishes from the table. The sand had gotten everywhere including the cooking pot and our glasses. At the time we finished our dinner the wind had become a sizeable storm and even though as a matter of prudence the tents were erected in the slipstream of the cars we had to tie them down with heavy rocks. The fire was lit in a dug out pit but was almost useless, because all heat was carried away horizontally with the wind. An hour before midnight the howling storm reached its peak. As I went for a last inspection round I found the rods in Marc’s tent broken, the complete structure flattened and almost covered by drifting sand. Over the wind I called for Marc to give me a hand repairing his retreat and was utterly surprised to hear him answer from within the collapsed structure. Cursing and spitting sand he emerged from the flapping tent and together we splinted the poles and added some water canisters to weigh down the windward side. As I went into my own tent I had to dig out my belongings from the fine sand that had found its way through the mesh of the air vents. My sleeping bag felt stiff and frozen and despite the insulation matt I instantly felt the cold creeping up from the rocky floor. This is the friggin Himalayas I thought and planned to improvise some additional insulation for the coming night, otherwise I’d be in serious need for some vacation after this ‘recreation trip’. When I woke early next morning I felt like I’d been hit by a train. Frozen to the bone, mouth nose and ears full of sand and every muscle and joint in my body ached. The others didn’t look any better. At least the wind had died, but instead a thick fog now enclosed the mountain, coating every surface with morning dew. To make matters worse, Marc’s car had a flat tire that needed repair before we could break camp and leave. According to the topographic data the highest elevations in this part of the desert were some 35 miles southwest from our position on the hammada of Zamlat Arraguene and so we left the summit camp that we had dubbed Nanga Parbat and departed in that direction. Around noon we stopped for lunch. While studying the satellite map we wondered whether the darker terrain pattern further south was indicating vegetation. I doubted that and rather expected fields of Rainerite or similar dark outcroppings. The others had different opinions. ‘We won’t know until we get there’ I shrugged. ‘Perhaps there’s a way. Why not try the drone?’, Andi suggested, which was considered an excellent idea. Our drone was a simple construction that consisted of a towing kite, a dur-aluminium rig to mount the camera, a GoPro unit and 250 yards of Kevlar rope. 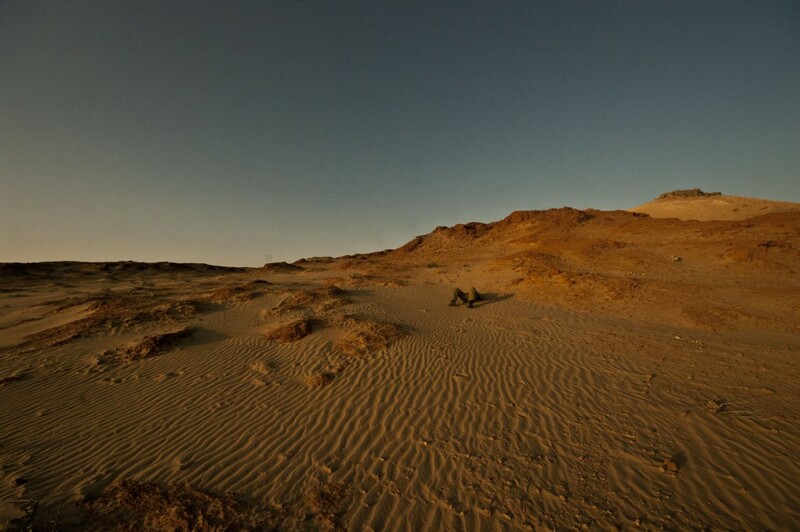 On previous expeditions I had always regretted our limited range of sight in the flat desert. Particularly if one of the cars got lost, which sometimes happened, other than stepping on the car’s roof and taking a look around with the binoculars there was no way of increasing our visibility. What we lacked was some artificially elevated position that would give us the additional one or two miles visibility. Months before the start of the expedition I had discussed the matter with Andi. At first we researched technologies based on radio controlled helicopters and model planes, but there was reasonable doubt that these sophisticated devices would remain operative under the harsh conditions in the Sahara. We needed something simple and heavy duty that would require a minimum of maintenance and that could be repaired by the tools available. Finally we agreed to try a kite. Based on average wind data and the estimated weight of the rig and the GoPro unit, Andi researched a suitable kite. He found a model that would provide sufficient lift to carry up to four kilos of cargo during moderate wind velocities and he began to build a rig for the camera. His first test flights, which were conducted with a weight simulating the camera, went successful and after a few modifications our recon kite was ready for deployment. This was its first mission. Because we had chosen a parachute type kite that did not require any supporting structure, the device was ready to launch within a minute. The kite was a double chambered 2 by 2 meters chute with an effective lift surface of 8 square meters. Although there was only little wind the kite easily climbed to an altitude of 650 feet. The shutter interval of the GoPro was set to 2 seconds, so we could expect 150 photos from the 5 minute flight. Since the wind was blowing almost from the north we had aimed the camera along the axis of the kite to the south. The GoPro camera was equipped with a 170° wide field lens, thus, directional aiming was of lesser importance anyway. After its flight the kite was pulled back in and while Andi was disassembling the rig and stuffing the kite back in its transport bag, Thomas, our technician in charge, had already removed the SD-card and uploaded the pictures on his laptop. We gathered in the shadow of the car to study the images on the small screen and were totally amazed by the new perspective. Although the standard resolution of the GoPro was too low to identify terrain details in the distance, it was absolutely sufficient to spot a car-sized object far beyond our normal range of sight. ‘Awesome gadget” Sergey commented. ‘Hats off to Andi our flight engineer’, I agreed. 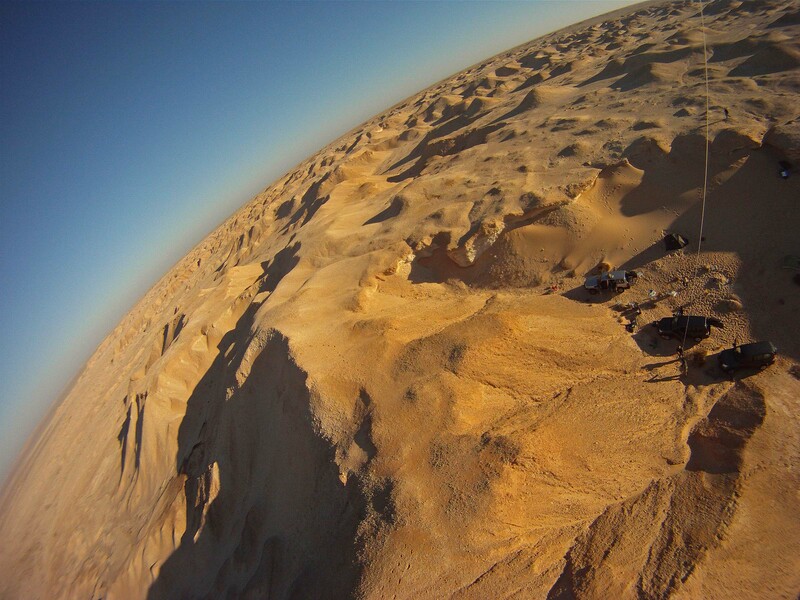 Now that we had tested our poor man’s drone successfully we planned to deploy it more regularly, and if it was just to shoot an aerial photo of our camp or to get an impression of our wider surroundings. 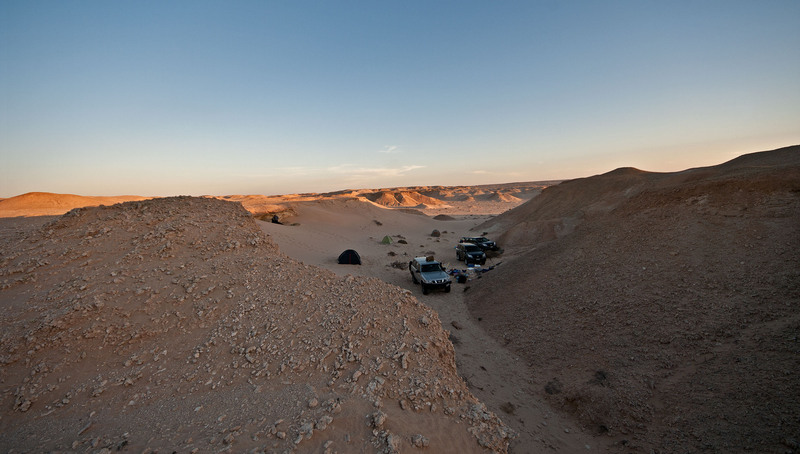 In the later afternoon we reached the southernmost tip of the Draá Afrafir, the dune belt that we had crossed the previous day. On that occasion I beached our Land Cruiser by running it upon the crest of a shallow solitary barchan. ‘For demonstration purposes’, as I emphasized. At least my little mishap provided welcome opportunity to test our towing cables. However, I had not counted on Thomas’ superior off road skills. While I was preparing the ropes and spring hooks he had nonchalantly jumped in the seat, pushed in the 4WD Low, and although the vehicle was buried in the sand to the floor pan, with a little the help of the others pushing, it slowly started to crawl backwards inch by inch. When the Land Cruiser was back on firm ground Thomas got out pokerfaced. ‘And where did you learn that?” Andi asked. ‘Been watching a lot of Eurosports lately, Paris – Dakar and stuff …’, Thomas smiled back. I made a mental note to take a few sand driving lessons from Thomas on occasion. Although we had worked hard from dawn to dusk with only few breaks, our efforts didn’t pay off that day. When there was only half an hour of light left we met to fix a campsite. The wind had increased again and the sand was moving horizontally at ground level. To my question what he had in mind for dinner, by pointing to the whirlwind outside, Marc jokingly answered ‘sand-soup”. That pretty much nailed what we would have to expect if we stayed on the open plain. Instead we picked one of the larger dunes and moved to its lee side, parked the cars behind the 20-foot slipstream face and began to unload firewood and kitchen gear. After we had pitched our tents and set up the dinner table I grabbed my camera and together with Andi went for a stroll around the camp. Because of the wind-borne sand we tried to keep in the wake of the dunes. This was not always possible and we were happy to have our chechs wrapped around our heads and the dust goggles to protect our eyes. In the interdune corridors the sand polished desert pavement contained many beautifully coloured quartzite pebbles, one of which, a salmon-pink ventifact, I pocketed for my two-year-old daughter. Meanwhile the barchan towering our camp had come alive in the wind. The sight of the massive yet elegantly shaped ridge of sand, framed by a halo of blowing particles, its contours ever shape-shifting in the storm, was a spectacle you couldn’t turn your eyes away from. Like a semi transparent veil, perceivable through billions of moving particles, the air stream skimmed over the sand body, seemingly without touching it. With its changing outlines and the ochre jets blowing angrily from its arched crest as if it was shaking off millennia-old dust, the barchan appeared like a giant beast woken from a prehistoric past, which – considering its origin at the end of the Neolithic Subpluvial – was exactly what it was. In the slipstream of the dune life was good. The wind was bearable, the fire burnt bright and Thomas even decorated the dinner table with a set of improvised lanterns. Instead of a sand-soup Marc again had prepared an exceptional three course dinner. With the limited supplies at hand, one could only speculate how he maintained such an excellent cooking level that significantly contributed to the team’s excellent morale. I wondered if the ingenious Swiss possessed some secret storage where the selected ingredients were kept. Later, at the campfire, the conversation somehow came upon the ever present zip-ties that everybody used to tie his gear or would make smaller repairs with. Someone mentioned that they were ideal to tie up a disagreeable fellow traveller, a claim which I insistently denied. This was followed by the inevitable demand to deliver proof, and so I spent a good part of the evening providing entertainment by demonstrating different ways to escape from zip-ties. The night was uneventful and at sunrise the wind had died. In the chilly air our breath condensed and if it hadn’t been for the desert panorama it felt like a beautiful winter’s day back in Germany. The early morning was reserved for vehicle and gear maintenance and while Andi re-filled the tanks from our sulphuric-acid-canisters I made an effort to catch up on navigation. To stay in practise, part of my morning exercise was to mark a spot on the topographic map with our suspected position, which I derived from the bearing and distance travelled from our last GPS-confirmed position. Then I would fire up the GPS and transfer the coordinates of our actual position to the map, mark it and compare it to my previous estimate. In the open desert, due to the small scale of the map and the total absence of relevant landmarks on the ground, this sometimes gave surprising results. This time, however, I must have done something right as the two pencil marks came out right onto each other. Over the next two days we continued our search by traversing the Rheg al Moum southwards before we turned west again to cross the Zamlat Sawiyah on the third day. Vast gravel plains changed with deep queds and the occasional group of warped acacia. 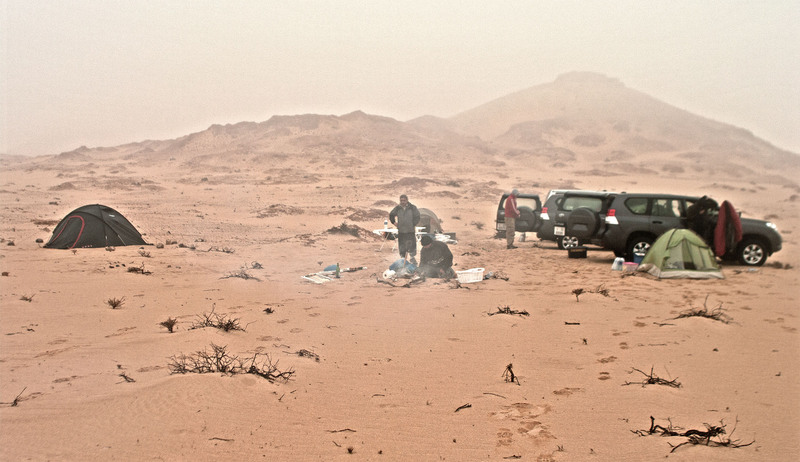 We had reached the Graret Tinimit, a karst depression similar to the Aouirtefou that was deeply cut into the plateau and that bore witness to extended humid periods in the Sahara’s ancient past. After a lunch break we separated and conducted a radial reconnaissance manoeuvre. Andi and I covered the northern radiant but even after four miles of searching in walking speed and an extended foot walk, we found nothing more than an old sandblasted bottle from a long forgotten campsite. Except for firewood, the others returned equally empty handed. Despite the excellent search grounds that we crossed, it was as if our efforts to find meteorites were under a spell. We had tried every tactic from meticulously gridding a selected area with three cars and minimum distance between our tracks to walking hours on foot. We searched the top of the escarpments and the valleys below, but to no avail. We arrived at camp more exhausted every evening and yet none of us could come up with a hypothesis for our lack of success. One evening we descended into the maze of canyons eroded from the Imirikli Labyad plateau by a large dry riverbed with the unpronounceable name Wadi Laouehiwanryat. Following meandering ravines and narrowing gullies at some point I must have taken a wrong branch and thus ended up in a dead end with the others piled up behind me. The steep gravel banks, however, offered ideal protection from the wind and so it was decided to stay there for the night and the place was declared our camp site. After another splendid dinner of beef that was followed by a fresh fruit salad, Marc poured us a Whiskey ‘to aid digestion and to fight the bitter cold of the desert night’. From a large Styrofoam box that we had used to store fresh vegetables and fruits and that was no longer needed because we had consumed all of its contents, I fabricated an insulation matt, which from there on served me quite well. Andi too, was fed up with the freezing temperatures outside and thus decided to try to sleep in the co-driver seat this night. While I did hear some irritating noise after I went to bed, it was not until the following morning that Andi filled me in on the full extent of what had happened. Andi took my laughter for disbelief and exclaimed: ‘No kidding mate – that rock was still burning!’ He continued on that while desperately trying to get rid of the thing he failed to locate the door handle in the dark. And when he finally succeeded, he flung out the vicious stone into the night. I was already holding my stomach at Andi’s story when Thomas grabbed my shoulder and said, ‘wait dude, it gets better: Rainer and I had a perfect view on the unfolding developments from the fireplace. After we heard Andi’s muffled curses from within the car and then the door slammed, Marc, who must have been a little offended that his generous gift, which he had so lovingly prepared, was so unceremoniously disposed of, returned to retrieve it. We saw him pick up the smoking stone and it appeared that he was determined to use the disdained bed warmer for its intended purpose. With the smoking stone under his arm and accompanied by our laughter he disappeared into his tent. We were still cracking jokes about it when a couple of minutes later Rainer suddenly pointed into the dark saying What the hell is he doing now? According to Thomas, it took some more shouting until Marc woke up. ‘What’s wrong with you dudes? Why can’t you let a guy sleep in peace?’ he muttered. ‘Sorry to disturb you mate,” Thomas replied, ‘it’s just that your tent was burning.’ ‘What?’ In disbelief and now wide awake Marc stared at his smouldering sleeping bag and the frayed hole in his tent. ‘I already wondered why it suddenly became so comfortably warm’, he mused and added: ‘I thought it was the bed warmer’. Although the fire had burnt through his sleeping bag, blanket and tent, Marc, due to the quick reaction force that came to his aid, had miraculously remained unscathed. The stone was removed from the tent and inspected by Rainer and Thomas. To nobody’s surprise it was found that together with the rock Marc had unfortunately grabbed a considerable amount of ashes from the fire, which subsequently had ignited the newspaper wrapping. It had not occurred to him that paper might have been a suboptimal choice in combination with a bed warmer from the fire. After the interlude Marc went back to sleep as if nothing had happened, while Rainer and Thomas did not dare to go to bed, afraid that a pocket of embers had withstood their extinguishing. So they kept watching what remained of Marc’s tent for another hour. Although the humorous aspect of the incident did not escape me, I was concerned for reasons easy to comprehend. Therefore, when Marc declared that he would refrain from using newspaper-wrapped bed warmers in the future, this was much appreciated by everybody. Andi didn’t mind the discomfort of sleeping in the co-driver’s seat, although it only allowed sleeping in a beach chair position. Instead he was looking forward to spend his nights without the endless flapping of his too small tent in his face. Because he had planned to sleep in the car anyway, he happily agreed to give Marc his tent. We had two spare blankets to replace the burnt sleeping bag and so we were good to continue. Following our usual practice of thermal disposal someone had to put the remains of Marc’s tent on the fire. Before it became a victim to the flames I managed to salvage a few eyelets and one of the aluminium rods. ‘What in heaven’s name you need this for?’, Thomas asked. ‘Might come in handy some day’, I shrugged. Pitifully he shook his head and muttered something that sounded like obsessive hoarding of useless ballast. On previous field trips, however, I had made the valuable experience that metal sheets, bolts, rods and eyelets in particular, were much sought after and never available, when we were forced to improvise necessary repairs of vehicles or gear. For this purpose I already kept a box in the back of our car in which similar spare parts awaited their deployment. After packing my gear and lashing it in the back of our truck I fished for a soda in our supply box, but to my surprise none was left. I asked Andi and he too was convinced that early in the morning there still had been at least two cans left. We suspected one of the other crews were looting our trunk, but to our frustration hadn’t caught anybody in the act yet. Mutual looting of our collective, yet separately stored supplies, was considered a sport between the individual crews, us included. Probably the invitingly opened door had been a trap. Thomas, however, had made the mistake not to get rid of another piece of inculpatory evidence, and when I asked him whether that can of soda he was sipping from did not look suspiciously like the ones that went missing under mysterious circumstances from our car this very morning, we had achieved a standoff. Under general amusement it was agreed that each party could keep its loot. In order to find a way out of the maze of canyons Andi, with the help of Sergey and myself, launched our kite and by studying the first images we soon found out that the valley opened into a wide depression ahead in the west, not far from our location. Of course we could have gathered this bit of intelligence by a simple look at the satellite chart, but this way we were rewarded not only with a series of a real-time images of the stunning landscape, but it was also much more entertaining. We started in the indicated direction and began our search shortly thereafter. Two and a half miles later we reached the far side of the valley. After five hours without a noteworthy incident we came into an area that was littered with excrement of camel, goats and donkeys and which was crossed by countless tire tracks. It was obvious to everybody that these heavily frequented grazing grounds provided suboptimal conditions for our search, since a large portion of the local Berbers were on the lookout for meteorites too. After another six miles it became clear that the terrain wouldn’t change and probably covered all of the area up to the 50 mile distant Atlantic coast. Running out of search grounds we had to come up with a new plan. Since we had left the Gart Aouirtefou, the site of our first meteorite finds, we had travelled almost 700 miles – to no avail. Perhaps we had plainly overlooked a crucial parameter in the geological and topographic setting that determined a meteorite aggregation surface in this desert. The thought that we had missed a piece of the puzzle, that we had overlooked some tell tale pattern that would enable the recognition of these concentration areas, and thus continuously failed to recognize them, was nagging at me. In order to find out we had to return to the first site. Did we even have enough fuel? Andi, who was in charge of bookkeeping did a quick calculation of our reserves and declared we were good to go another 242 miles if we distributed our diesel surplus equally between the cars. After deducting the usual safety margin we still had a range of 217 miles per car. This was sufficient to reach the Aouirtefou, search the site another two or three days and return to the next settlement, the 63 mile distant Cap Boujdour, with a reserve of approximately 12 gallons. It was only a brief powwow. Everybody was eager to search again in a confirmed DCA and so we unanimously decided to go back northeast and to return to the Gart Aouirtefou. Our course to the 56 mile distant basin would take us through rough terrain for the first 12 or so miles. For the area directly ahead the satellite chart showed what looked like coarse alluvial rubble that would require slow and careful driving. After that we would cross another serir plain on which we would be able to speed up again. I estimated the traverse to take us around two hours, however, I hadn’t taken into account another flat tire and in the end, despite a high speed interval of one hour, we needed three hours until the now familiar outlier mountain that marked the Aouirtefou valley came into sight. Since none on the topographic maps that we possessed had a name for this prominent landmark, we dubbed the inselberg ‘Jebel Nayzak” on this afternoon. Considering the many finds we had made in its neighbourhood Meteorite Mountain deemed us quite appropriate. With only one hour of good light left, we limited our search to the fringes of the plateau of Zamlat Swid and shortly before dusk we entered the floor of the qued once again. I got up before sunrise to climb up the slope and capture the unreal atmosphere with a fisheye lens. The foggy landscape was drenched in opaque orange. If it wasn’t for the sparse vegetation at the valley floor, this could as well be sunrise over the Valles Marineris I mused. Breakfast was a quick business because with the exception of dry bread and coffee not much was left in our supply box. This time getting up early paid off. On this morning it was Thomas who scored first. Between the shrubs of a small blow out he found a multi-kilo sized mass that had fragmented due to an extended period of terrestrial weathering. Almost a hundred pieces were now strewn about a 15 x 30 yard mini-strewnfield. Based on the data Rainer subsequently obtained with the SM-30, it first appeared as if the meteorite was paired with the earlier weathered finds. Because there were some deviations in his results he repeated the process with more fragments and found out that the new find rather belonged to yet another fall event. If this was confirmed during the analysis in the lab, the material we had found so far would actually represent three overlapping strewnfields. 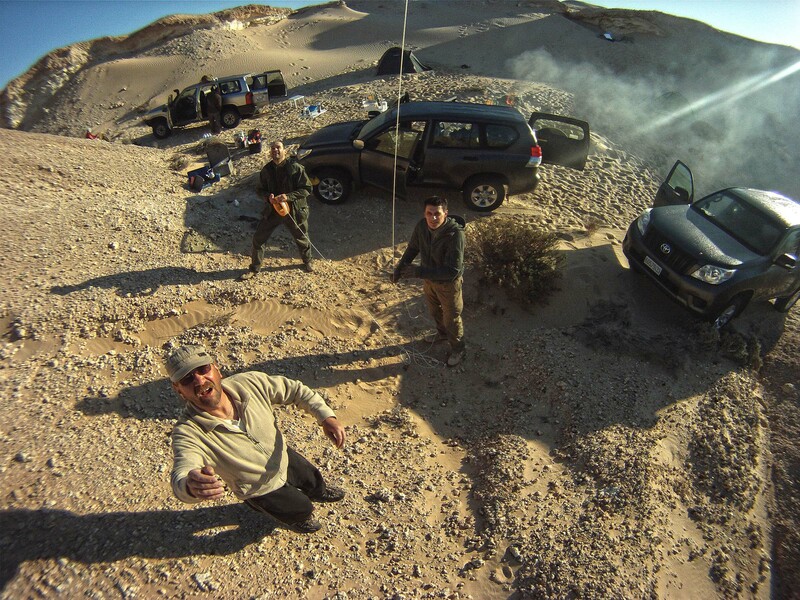 While Rainer and Thomas had a blast picking up and cataloguing meteorites under the bright Sahara sun, Andi and I followed in the wake of Marc’s car. Our course was due north, along a virtual line in which we assumed the axis of the fall that had produced the fresh L-type chondrite of which we had found two masses already. Because at present all that we had were two sets of coordinates that unfortunately were quite close to each other, it was possible if not very likely that we were barking up the wrong tree. For an hour we slowly crossed back and fourth along the estimated axis. On occasion of a brief stop I scanned the horizon with the binoculars and spotted Marc and Sergey occupied with the diligent inspection of an object on the ground. Some moments later I rubbed my eyes in disbelief because I thought I had seen them chink glasses. ‘They are raising glasses, I told Andi without lowering the binocular. ‘Isn’t that what they always do?’, it came back unimpressed. ‘Dude, it is ten in the morning’, I added for consideration. ‘You’re right, perhaps a bit early, so let’s go and find out,’ he suggested, which we did. Half way along we observed how the two got back in their car and resumed their work. Due to their chaotic search pattern it took us a while to intersect their unpredictable course but finally they must have seen us and stopped. By the look of Sergey, who was grinning from ear to ear and which was a rare occurrence for the borne-and-bred Russian who rarely showed apparent emotions, one could tell that they had found another meteorite. ‘Hey guys, still empty handed?’, Marc greeted us cheerfully. ‘Congratulations! How many kilos?’, I replied. ‘Just a fistful, but fresh as the day it dropped’, Marc smiled. Sergey handed us the zip-lock bag that contained an angular yet smoothly rounded mass covered in delicate fusion rind. Indeed, this was doubtlessly the third mass of the pristine L-chondrite we had found the very first day at this site. Prior to this find, the two coordinates that we had for this fall event were only 250 yards from each other. Too close to derive an axis of the strewnfield with certainty. This time, with 1.36 miles, the distance between the furthest find positions was sufficient to draw a line that would not be too far off the true axis of the meteorite’s distribution area. Eager to make our own find of the day Andi brought us back on track. Following the new axis, to our great dismay, after just another mile and a half, we ran into the same field of black silcrete debris that we had encountered when searching the area for the first time. On consulting the satellite chart we were literally shattered to see that it stretched over a vast area and included all of the northern part of the potential strewnfield.